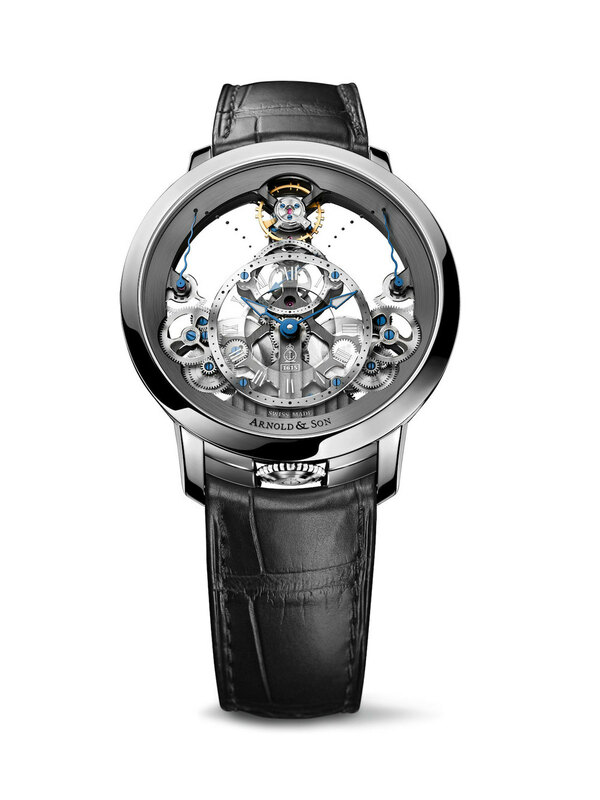 News: Arnold & Son Unveils the Time Pyramid in Stainless Steel. A Fascinating Timepiece and a Real Treat for the Eyes. Arnold & Son unveils a new reference of its iconic Time Pyramid featuring the hand finished A&S1615 calibre treated in NAC grey, housed in a stainless steel case. The A&S1615 movement with unique skeletonized pyramid-shaped architecture, was conceived, designed and developed in-house. The movement A&S1615 seemingly floats between two sapphire crystals, the Time Pyramid is a masterful rendition of technical prowess and unparalleled elegance. This superbly engineered wristwatch is part of the brand’s Instrument Collection that combines instrument precision with classical styling. The skeletonized caliber A&S 1615 follows the original regulators from the brand with its component positioning and detailed 3D visual appeal. Movement parts and watch indications are built on three levels, with the subsidiary seconds dial on the bottom, the hour indications on a sapphire crystal dial in the middle level, and a silver top ring for the minutes indication. 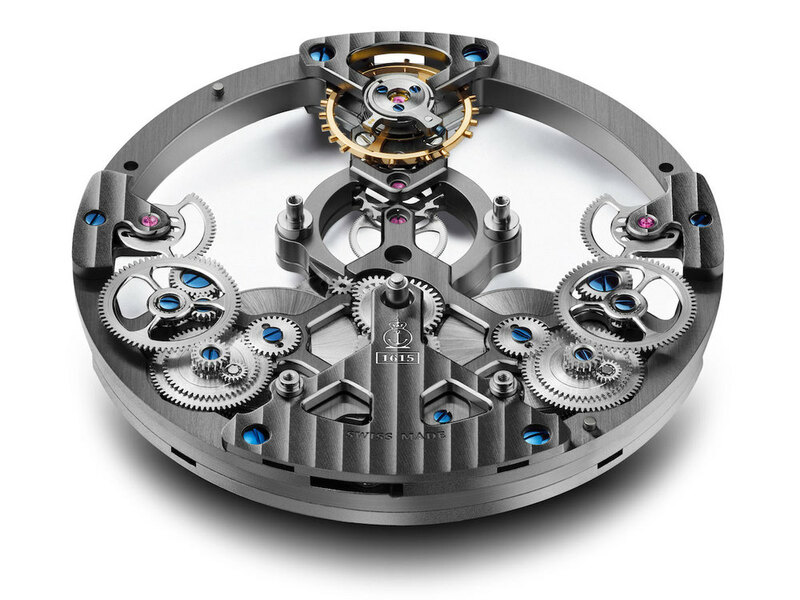 While the movement is extremely thin-at just 4.4 mm —the multiple levels bring amazing depth and detail to the watch. To further enhance the balance and symmetry of the Time Pyramid, the crown —with Arnold & Son’s engraved logo— is artfully positioned at six o’clock. The gear train runs vertically in a linear format connecting the two barrels at six o’clock to the balance wheel at twelve o’clock, and endowing the movement with its pyramid structure.The bridges are designed so that all of the wheels, the two main spring barrels, the escapement and balance wheel are all magnificently visible from the dial side. 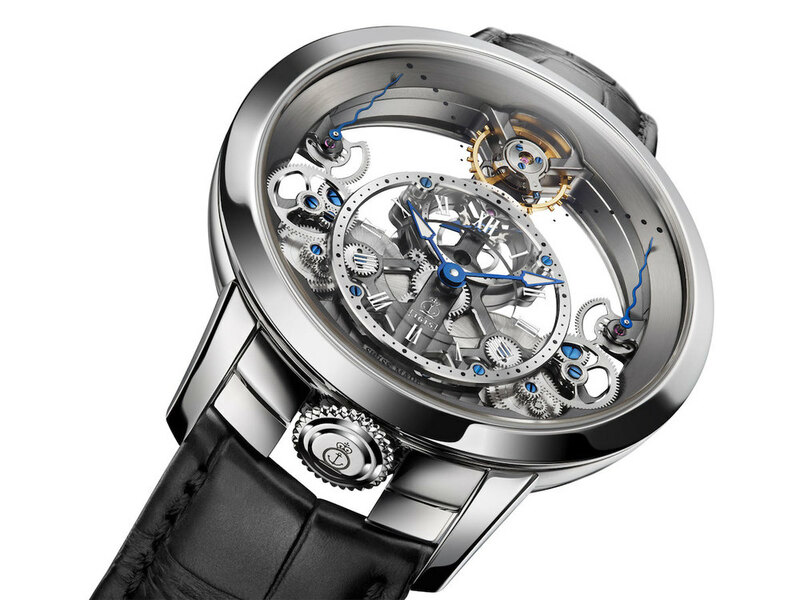 Additionally, the movement is fitted with two power reserve indicators –one each on either side of the linear gear train –to display the energy level for each barrel separately. The power reserve hands indicate the reserve level via graduated dots —that are printed under the top sapphire crystal— in an arc format, and demonstrate how one barrel transfers energy to the second one when needed. Essentially, as the first barrel winds the second one, the power reserve indicator of the first barrel goes down, while the second one goes up –making for an accurate and intriguing readout. The two mainspring barrels supply the hand-wound caliber with an amazing 90 hours of power reserve, and provide a more constant force to the wheel train. 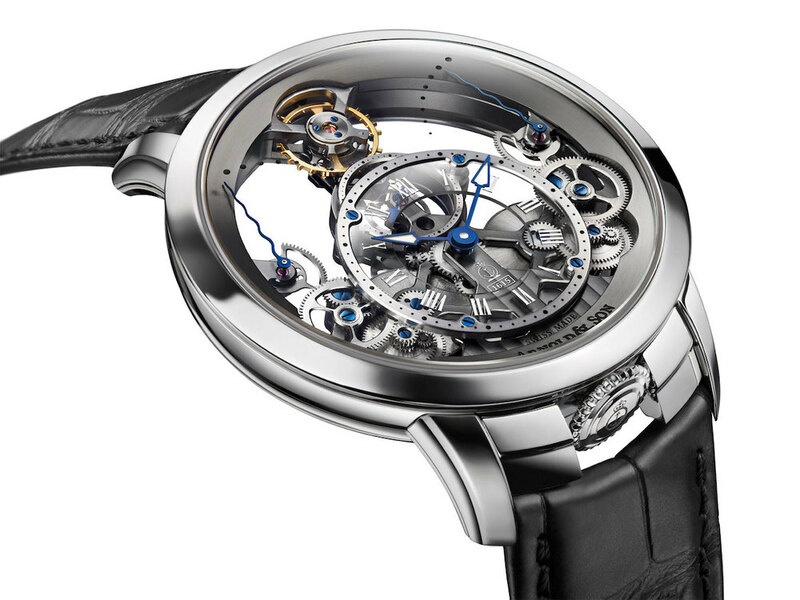 As with every esteemed Arnold & Son watch, the movement of the Time Pyramid is magnificently hand decorated with manually chamfered brides and high-polished edges, Côtes de Genève, circular satin- finished wheels and blued screws, all yielding a striking masterpiece of decorative craftsmanship and brilliant execution. Calibre: A&S 1615 with 27 jewels, manual wound, diameter 37 mm, thickness 4.40mm, power reserve over 90 hours, 21,600 vph. Dial: sapphire, circular satin-finished dial frame with chamfered and polished edge. Hands: blued hands with white Super LumiNova. Case: stainless steel, diameter 44.6mm, cambered sapphire with anti-reflective coating on both sides, case back see-through sapphire, water-resistant to 30 m.
Strap: hand-stitched black alligator leather. Posted on January 11, 2014 by Editor & Publisher and filed under News, Arnold and Son and tagged Arnold & Son Time Pyramid Arnold & Son Time Pyramid ref. 1TPAS.201A.C124S Arnold & Son Calibre A&S 1615.